Published on May 25, 2010 in Elections, General T&T, Media, PNM and Politics. 19 Comments Tags: Patrick Manning, Politics, T&T Govt. Former Prime Minister Patrick Manning said he will take full responsibility for the People’s National Movement’s (PNM) loss to the People’s Partnership in yesterday’s General Election. Addressing a handful of loyal supporters at PNM headquarters, Balisier House, Port-of-Spain last night, Manning said the results came as somewhat of a surprise to him. “I am here to concede defeat in the General Election 2010. We had reason to believe we were going to be successful, but it just didn’t work that way. I want to assure you that it’s not the end of the world or the end of the political world. “We in the PNM believe in democracy. The people have spoken and some say that the voice of the people is the voice of Almighty God. We accept the results and I accept full responsibility for it,” Manning said as supporters, some of whom said they would continue to support the PNM leader despite the loss, applauded. Manning arrived at Balisier House at about 10.30 last night, even before going to his constituency office in San Fernando East, the seat which he won and has represented since 1971. Trinidad and Tobago wakes up this morning to a historic new chapter being written by its first female Prime Minister Kamla Persad-Bissessar after her coalition People’s Partnership (PP) won yesterday’s general election. KAMLA PERSAD-Bissessar, 58, will be sworn in as Trinidad and Tobago’s first woman Prime Minister after the UNC/COP-led coalition pulled off a landslide victory in yesterday’s historic General Election. Fireworks lit up the night sky at 1 am today as Kamla Persad-Bissessar took to the stage to thank thousands of supporters for assisting the People’s Partnership in securing a victory over the PNM. The crowds chanted “Kamla” continuously while the reggae and pop music blasted from the speaker boxes. THERE is absolutely nothing to be afraid about following the People’s Partnership’s historic victory at the polls, Prime Minister-elect, Kamla Persad-Bissessar, said in her victory speech at Rienzi Complex, Couva, last night. Former Prime Minister PatrickManning said he will take full responsibility for the People’s National Movement’s (PNM) loss to the People’s Partnership in yesterday’s General Election. The victory of the People’s Partnership in yesterday’s General Election ushers in a new era in the politics of our country. And we say this not only because we are now going to witness the swearing- in of our first Woman Prime Minister. The issues of this election were wider and deeper than the gender of the winner. COP leader Winston Dookeran vowed to heal the nation and bring its people together, in his victory speech after last night wresting the key marginal seat of Tunapuna from the PNM’s former MP Esther Le Gendre. “Be cool! Be cool!” he said, repeating the advice he gave just days before Election Day. The latest tally was that Dookeran had won 9,687 votes to Le Gendre’s 7,465 votes. Congress of the People MP for Tunapuna Winston Dookeran says the People’s Partnership landslide victory at the polls was five years in the making. The People’s National Movement (PNM) not only lost the general election yesterday. The party also gave up the popular vote. Political leader of the Tobago Organisation of the People (TOP) Ashworth Jack says Tobagonians have been staying away from voting for too long. ALLEGATIONS of thuggery and intimidation surfaced within the controversial marginal constituency of St Joseph yesterday, as thousands of voters cast their ballots to decide if the People’s National Movement’s (PNM) Kennedy Swaratsingh or United National Congress’ (UNC) Herbert Volney would represent them for the next five years. Within two hours of the closing of polls UNC political leader Kamla Persad-Bissessar formally declared that she retained her seat with a little over 50 per cent of the votes tallied yesterday as thunderous applause erupted at her Siparia constituency office. THE Elections and Boundaries Commission last evening reported that there were no major problem in relation to yesterday’s voting process from the various polling divisions at the close of polls. When the smoke of the general election battle had cleared last night, People’s National Movement (PNM) stalwarts like chairman Conrad Enill, and public relations officer Jerry Narace were left surprised by the beating their 54-year-old party had taken at the polls yesterday. Economists and political experts agreed last night that former Prime Minister Patrick Manning was reckless to call an early general election and paid the ultimate price for his mistake. They agreed too that he should resign, even as they congratulated Kamla Persad-Bissessar as the country’s Prime Minister-elect. MOST of Central Trinidad was thrown in to party mode last night, as the People’s Partnership took home a resounding victory in Chaguanas East, West and Caroni Central. Overnight, it seems, a settled political order represented by the ruling People’s National Movement has been overthrown, with profound implications for the future of public affairs. Approximately 12 hours ahead of yesterday’s general election results, outgoing Prime Minister Patrick Manning was confidently projecting that the ruling PNM would win more than 21 of the 41 electoral seats. Manning delivered his forecast to reporters about 9.30 am yesterday, after he and his wife Hazel cast their ballot at Belmont Secondary School. Also voting at the same venue was PNM Port-of-Spain North/St Ann’s West candidate Patricia McIntosh. Manning and his wife arrived around 9.15 am, accompanied by a heavy security detail. Former judge Herbert Volney yesterday romped to an overwhelming victory over the PNM’s Kennedy Swaratsingh, as he claimed the St Joseph constituency for the People’s Partnership. “Volcanic Volney”, as he was called by his constituents, won the seat convincingly by a margin of 2,287 votes. Jack Warner, chairman of UNC, said last night that the local government elections would be held before the end of the year. Warner repeated an election pledge that a prime minister would be permitted two electoral terms and that there would be fixed election dates. He also reiterated that the new government would not permit the construction of an aluminum smelter and would not permit a property tax. He stressed that the Government’s work would begin today. He called on supporters to hold the administration accountable. The People’s National Movement has lost five of its safe-seats to the People’s Partnership in yesterday’s general election. THE PNM GOT WHAT THEY DESERVED, NOTING…………..
thank god time for a change give the woman a chance. The celebration must end soon so we can get down to business. There are a lot of corrupt institutions to investigate and those involved in squandering the people’s money must pay! Let’s hope Petrotrin, NGC, NEC, Udecot etc didn’t have enough time to burn all the evidence. Lets now prayer that our new Prime Minister will address the crime in Trinidad/Tobago. Too many good educated ‘sons/daughters of the soil’ fled to foreign countries in fear for their lives and the lives of their love ones. Also the hospitals are in such a horrendous condition that these poor ill people have no choice but to go there for medical treatment. please prove to yourself, and the world, that you have the heart and drive to make a difference and not to succumb to bribery and corruption as the past governments did. God bless, and good luck. For too long the people voted for PNM based on old bias and tradition. The time has come when the young people had to take control of their future and decide if they wanted a Country divided or restore our beloved land….Trini’s you deserve to be congratuated for voting issues not party! If “necessity is the mother of invention”, and it was necessary for Trinidad and Tobago to experience change in an effort to survive, then you, Ms. Persad-Bissessar, are indeed the “mother” of an evolution for our beloved land. The People’s Partnership has a challenging term ahead, as a coalition you are blessed to have many young energetic bodies to implement your plans, the wisdom of the mature to steer you away from corruption and to actively seek out altruistic behaviour, and diversity in people who will bring different perspectives. Please govern fairly, decisively, and with the best of intentions for “all”, not “some”. We, the people of Trinidad and Tobago, have given you the power because we believe better exists, now demonstrate to all of us that our collective belief is irrefutably true! I could not have said it better DR Baccus because I can’t imagine my beloved land living like the citizens of Jamaica overrun with curruption or like America where race has divided people…I want to see fair governance and anyone should be able to see where the money is being spent and contracts should be awarded by merit through a bidding process….I have hope for Trinidad! Finally…we are rid of useless people like.. Incompetent fools who were all part of the biggest wastage of money ever seen in the History of our country. When we should be saving as much we could and investing wisely in the education, safety, health and future security of the nation, they squandered like there is an eternal money tree. WISHING YOU ALL THE BEST IN YOUR COMING YEARS CONGRATS AGAIN. Congratulations Madam Prime Minister Kamla Persad Bissessar. You’ll do a good job. The people are behind you, both in Trinidad and Tobago. God bless you and your new government. Brooklyn NY. DIPLOMATIC CENTER HE WOULD NOT HAVE BUILT IT.THAT’S WHAT YOU GET WHEN YOU DID NOT WORK,SWEAT FOR IT.YOU HAVE NOT GOTTEN ALL YOU DESERVED YET THERE IS MORE TO COME. Not only is this a histoerical moment in Trinidad and Tobago in having a coalition government, but you also have the very first woman Prime Minister! !Congratulations T & T.
Now is the time to reverse all corrupt practices in all government offices, the police force, and the Courts and begin rebuilding your wonderful country.Get rid of the bullies and prosecute the corrupt Government officials and start with a clean slate. Forget the racial divide and work together as civilised human beings and make T & T a peaceful country once again. Outgoing Prime Minister Patrick Manning is moving to give up the leadership of the party following Monday’s heavy defeat at the polls. Manning advanced his plan to “disengage himself” from the leadership of the PNM during a meeting at Balisier House, Port-of-Spain, yesterday with the candidates in Monday’s election. 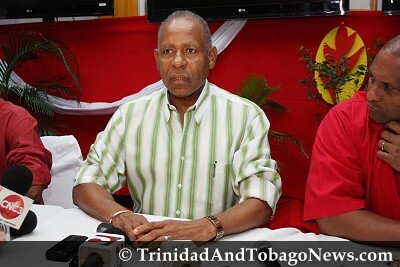 People’s National Movement (pnm) leader Patrick Manning has indicated a willingness to step down as political leader, but is prepared to hold on in order to give the party time to go through the process of electing a new political leader. Political leader of the People’s National Movement (PNM) Patrick Manning and his wife, Hazel, will shortly move from the opulence of the Prime Minister’s official residence in St Ann’s, to more modest accommodations. It would be irresponsible to state here what Mr. Manning should have done prior to the elections but be that as it may, the people have spoken in a loud and clear voice, they did not want Patrick Manning continuing as Prime Minister. Of equal truth is the fact that for the PNM to continue as a well respected party it MUST shed itself of Manning as it’s leader. He has had his time and done his thing ……. his way. The times have now and we must adjust to what we face for the future, Manning cant be a part of that future. The sooner he steps aside from any contention of leadership the better it would be for the party and the nation. Time and conditions will alter the mood of celebration that we enjoy TODAY, it may be more jubilation or less euphoria but reality will settle down to answer the question of whether the voters made the right choice in Monday’s election. When that time comes we better have the right people in place to lead us. even if we have to do it overseas untill we can get better and more hospitals, thank you.